When operating a bar, tavern or pub business, owners are very likely to be exposed to liability risks associated with intoxicated customers. It’s essential that you obtain the right insurance coverage to successfully protect your bar business with a Pub and Tavern Insurance Package. According to an article in Property Casualty 360, here are 5 liability issues bar, tavern, and pub owners need to watch out for. DUIs. This is the most common type of liability claim that stems from alcohol service to patrons. Every 2 minutes, a person is injured from a drunk driving accident. In 2013, there were 10,076 fatalities from automobile accidents involving a driver with a blood alcohol content of 0.08 or higher. These claims can also come from intoxicated customers operating boats or automated machinery. Activity hazards. Usually, as a bar owner, you expect the occasional bar fight, but what you don’t pay attention to are injuries from falls. Whether it be from the mechanical bull, or out of a chair, intoxicated patrons are likely to hurt themselves in other ways. Make sure you insurance policy claim covers all these activities in the coverage plan. Exit zones. In the case of fires or emergencies, it’s important that exit doors are not blocked, locked or malfunctioning. This risk is just as likely and claims can be made for property damage or bodily injuries. Keep aware of the working exits. Flammable decoration. This is also another exposure that, if not paid attention to, can be disastrous for owners. These damages can cost a lot of money and suffering tends to be high. So, make sure to consider this for the underwriting process. Fake IDs. As much as you want to avoid this, underage customers will enter bars with fake IDs. Consider investing in ID scanners to avoid having responsibility for underage patrons. 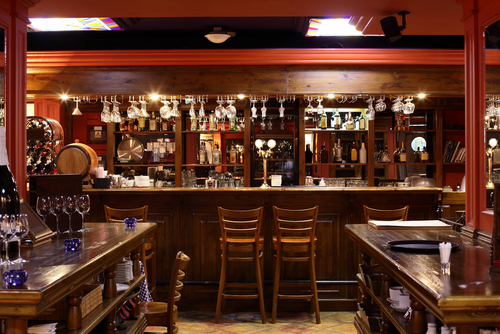 At RMS Hospitality Group, we offer a solid commercial liability insurance program to protect bars, pubs, and taverns. The liability program we provide at RMSHG covers the bar, food service, and valet parking and includes general liability, liquor liability, assault and battery, excess liability, and more. For more information on how we can provide you with your insurance needs, call us today at 888.359.8390.